Gluten free cauliflower pancakes make a wonderful appetizer, side dish, or vegetarian meal. Crispy on the outsides and cheesy tender on the inside, you will love this easy riced cauliflower recipe. Have you seen all of those fun riced cauliflower recipes on Pinterest lately? I have always wanted to try one, but the thought of ricing a cauliflower was a bit overwhelming. Do visions of cauliflower flying around my kitchen and creating a huge mess flash before your eyes? Not to mention, my kids are not big fans of cauliflower unless it is served raw with extra ranch dressing. These gluten free cauliflower pancakes are going to change all of that! Kids love them. And you can even use riced cauliflower instead of rice in risotto, check out this recipe for Shiitake Risotto! Toss the cauliflower rice into a large bowl and added the cheddar, leeks, and other ingredients. I formed pancake shaped cauliflower patties with my hands and carefully dropped them into the hot oil. 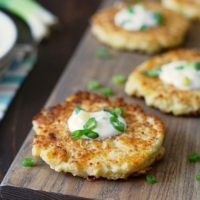 The riced cauliflower pancakes get so crispy and delicious. Try cayenne for a spicy kick! 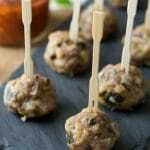 Click here to see all of my gluten free appetizer recipes. Lodge Cast Iron Skillet: This is by far my favorite pan and I do almost all of my frying in this. Food Chopper: I bought my cauliflower already riced, but if you can’t find it pre-chopped, this inexpensive food chopper will do the trick for you. Bob’s Red Mill 1 to 1 Blend: My favorite gluten free flour, it works beautifully in this recipe without making my pancakes gummy. Easy riced cauliflower cheddar pancakes. garnish with sour cream and scallion. Start heating oil in a pan on medium high heat. 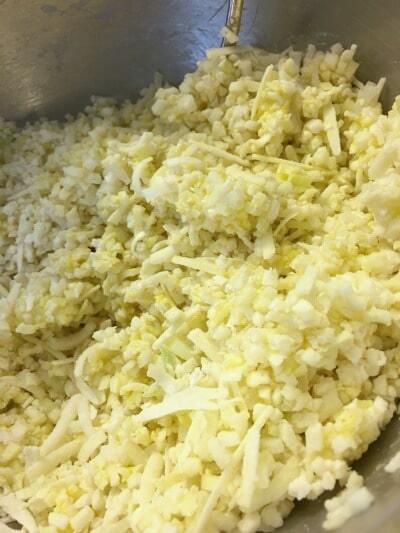 Add riced cauliflower, egg, cheese, salt, flour, leek and milk to a bowl and mix well. Test oil temperature by dropping a drip of water into the pan. If it sizzles, it is ready. Drop patties into the hot oil. Cook until golden on each side, about 3-4 minutes per side. 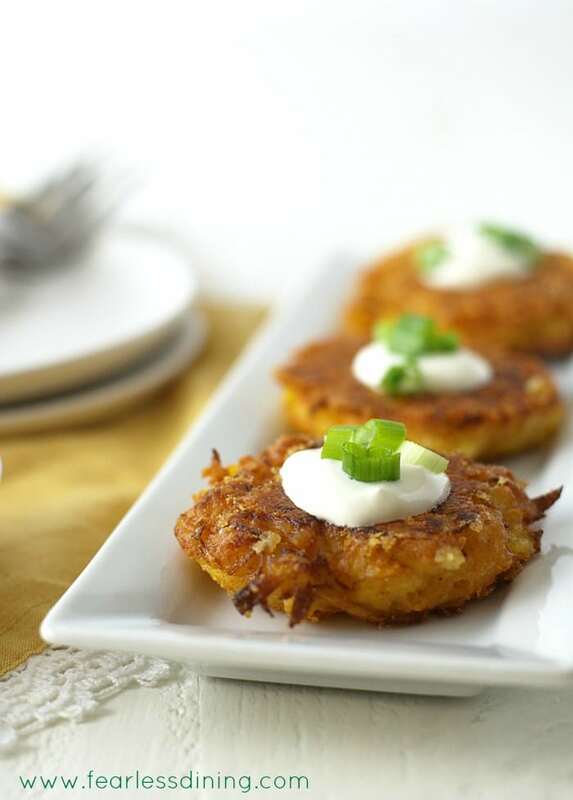 If you love vegetable pancakes, give these Delicata Squash Cheddar Fritters. Looking for a meal to enjoy after these appetizers? 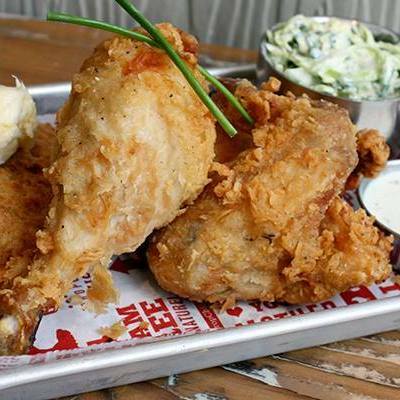 How about this amazing gluten free fried chicken recipe from San Francisco’s Proposition Chicken? These flourless chocolate peanut butter brownies would make a fabulous dessert! 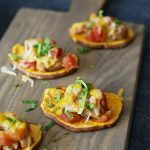 This is a genius idea love that you used cauliflower I bet these are super tasty I need to make them soon would be a great yummy surprise to add this to my menu. These sound healthy AND delicious–the best combination! 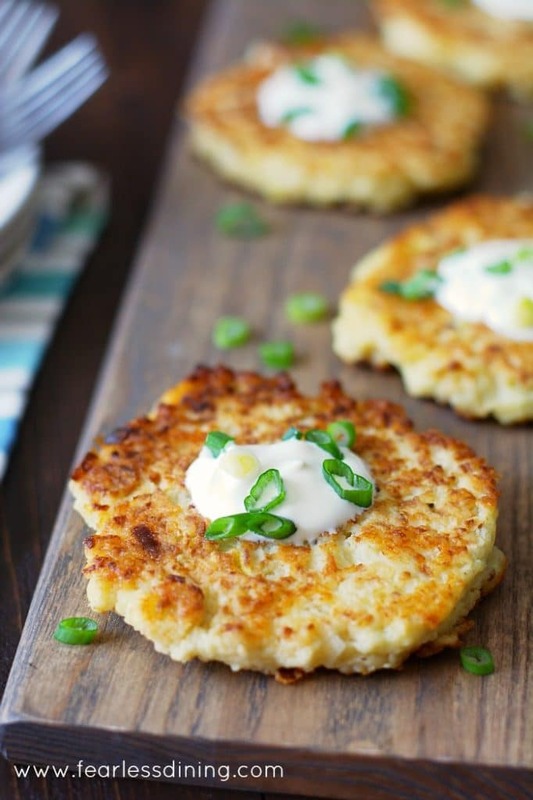 These cauliflower pancakes look fantastic! 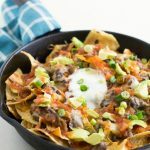 I love the crispy outsides and the fact that it has cheese in them makes them even better! Thank you Dahn, they certainly are great for entertaining. These look really good. Is it 9 net carbs for one pancake? Thank you. I would like these recipes I do not have a printer. Hi Geri, I tend to cook with my computer open. If you send your email, I can send a copy of this recipe to you…although I am not sure that would help if you can’t print? Please let me know. Sandi you had me at cheesy tender!!! Oh man!!! These look sensational. A dollop of sour cream, a ribbon of smoked salmon and a few baby capers and I think my guests would be super happy!!! Oooh, I love how you think Claire. Smoked salmon would make this recipe even better! Amazing! Usually anything this delicious is not exactly healthy but you’ve managed to make something crispy, deliciously cheesy AND nutritious. Sandi, looking for some new gluten free recipes of some classic dishes my family enjoys and saw this one. When I tried AP flour for a roux, I did not like how it changed the flavor. The pic looks great. Did you notice any flavor difference? Did it hold together? I haven’t really done much with roux Peter. I find potato starch (like in a chowder) works really well as a replacement. I didn’t notice any off taste with these cauliflower cheddar pancakes. They hold together pretty well, but you do have to make sure the oil is really hot so it cooks quickly. Mmmmmmmm,, can’t wait to try them. Hi Melissa, I have not tried either of the flours you ask about with this recipe. I would say definitely not to the almond flour as that wouldn’t help bind the ingredients. I am not sure about the coconut flour. It definitely absorbs a lot of moisture, but I haven’t tested it in this way. If you try it, please let me know how it turns out. 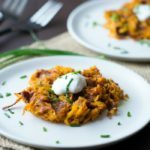 This sounds like a great way around my potato pancake obsession – way healthier anyway!!! I constantly use cauliflower as a substitute for everything, it’s so delicious and earthy! We think alike 🙂 Thank you for writing Taylor. These sound awesome! 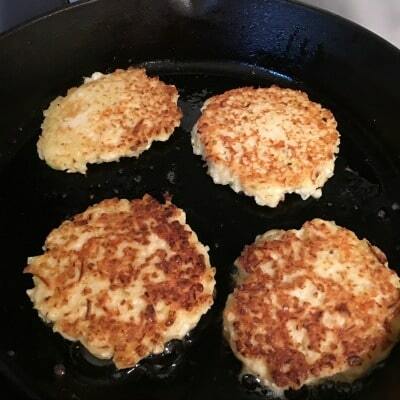 I’ve been trying to figure out a new way to use cauliflower….and I’ve actually been craving zucchini fritters, but haven’t tried making them gluten free yet….so this should satisfy my craving 😉 Also, just to put it out there, if your food processor is in good shape, making cauliflower rice is super duper easy! I’ve been making a gluten free jambalaya which my husband didn’t realize the “rice” was cauliflower until I told him! Hi Nina, I love that your husband couldn’t tell it was cauliflower rice 🙂 I hope you like these, even my kids gobbled them up. I appreciate your taking the time to write. Have a great week. Well that didn’t work…and I added more flour and finally in desperation eggs and it still all fell apart! I am so sorry Maureen. Let me see if I can help you. Can I ask a few questions? Which gluten free flour blend did you use? If it didn’t contain xanthan gum, you would need to add 1/2 teaspoon. Also, how hot was the oil when you dropped in a spoonful? I make sure the oil is bubbly hot, then I drop the batter in, then lastly press it down a bit to make the shape. Same here! I think it needs an egg! These pancakes are looking great! Just the perfect recipe to finish my cauliflower head I still have in my fridge. Yum! Oh yum, we LOVE cauliflower around here – my kids are ridiculous and start cheering when they see it at the farmers market! I had no idea TJ’s had a pre-riced mix, looks great for a quick and easy alternative. 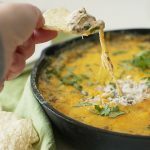 Good call on the Vermont Cheddar in this one Sandi! I bet these are awesome! Great little pancakes! And how much do you love Trader Joe’s?? Always to the rescue with something tasty! These look delicious! Love the addition of Vermont cheddar. 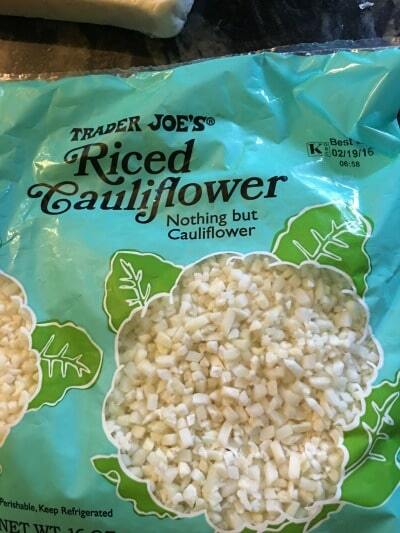 I didn’t know that Trader Joe’s sells cauliflower already riced. Will look for it later today, thanks! Thank you Amanda. I hope your Trader Joe’s has it. It makes cooking so much easier. These look like my perfect side dish, nibble, snack, appetizer, everything treat!! Simply genius! 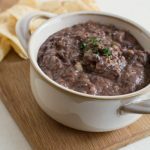 I love using cauliflower rice in recipes! Great replacement to potatoes too! 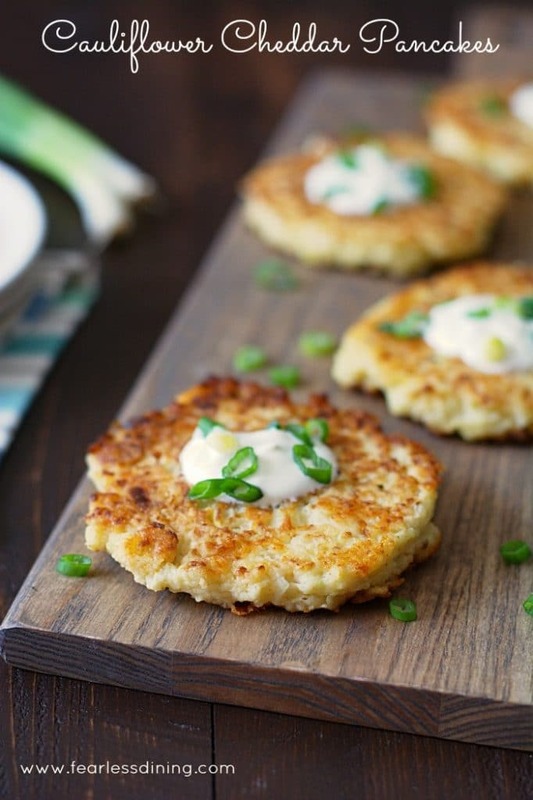 Cauliflower and cheese are such a great combo, so these sound great. They look like potato pancakes and would work great as a sub for them anywhere. I’m heading to TJ’s and buying that riced cauliflower to make these! such a great idea to use the riced cauliflower this way. Sandi, These look crispy and delicious. Lol. You are right about ricing cauliflower at home. I have…and it did get all over my kitchen! The lid came off the blender at a very inconvenient time. Water and cauliflower everywhere! I’ll look for it in the stores! Thanks! I had a feeling LOL. Thank you for the heads up on Trader Joes — we are due to go there soon and I’ve been wanting to make cauliflower rice. This is great. Your pancakes look delicious. Now I don’t like overly sweet things for breakfast — the pancakes would work beautifully. It really is good…and a huge time saver! Sandi, these sound delicious! I make a potato version of this that I love, but I think that riced cauliflower may just be even tastier! These look tasty, Sandi. And thanks for letting us know that TJs has already riced cauliflower! I sent the link to my daughter, who is a big cauliflower fan. I haven’t been converted yet but these make me want to try! My husband isn’t into cauliflower and liked this too.